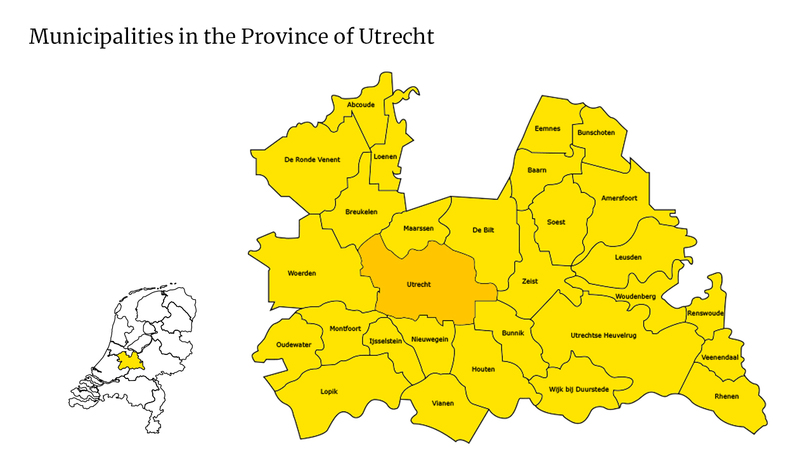 The Province of Utrecht is roughly the same size as England’s capital London and holds twenty-six municipalities, of which the municipality of Utrecht is one. Dutch and international students quite often choose to live in neighboring municipalities such as De Bilt, Zeist, Bunnik, Houten, Nieuwegein, IJsselstein, Woerden and Maarssen or in neighbouring towns such as Vleuten, Driebergen, Bilthoven, De Meern and Stichtse Vecht. Follow this link to download a map of the Province of Utrecht or click to enlarge the images below. The Dutch government cares for safe cycling tracks separated from the road. This makes the Netherlands a bike-friendly country. Because cycling is a healthy, affordable and sustainable method of travelling, many students living in the surrounding municipalities and towns prefer to commute to the city and the university by bicycle. No matter the weather!